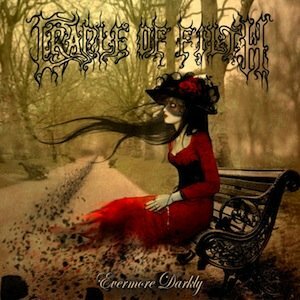 CRADLE OF FILTH - EVERMORE DARKLY LTD. EDIT. (CD+DVD DIGI) | Online Shop | Wizard LTD. Album: "EVERMORE DARKLY LTD. EDIT. (CD+DVD DIGI)"
A companion piece to 2010's triumphant 'Darkly, Darkly, Venus Aversa' album, the 'Evermore Darkly' CD/DVD package features new tracks & rarities, with a lengthy on-the-road documentary and a full set filmed live at this year's Graspop metal meet, as well as the video for 'Lilith Immaculate'. The CD features brand new track 'Thank Your Lucky Stars', plus a special remix of 'Forgive Me Father', courtesy of Rob C from Anthrax, an extended rendition of 'Lilith Immaculate', as well as tempered demo versions of three 'Darkly, Darkly...' songs. The mini-album closes with a special taster from Cradle of Filth's impending orchestral project, in the form of a haunting, classic reworking of fan-favourite, 'Summer Dying Fast'. The 'Evermore Darkly' DVD contains footage from Summer 2011, when Cradle of Filth embarked on a rapid spat of tours, accompanied by two eager filmmakers. The resulting documentary, 'You Can't Polish A Turd, But You Can Roll It In Glitter', combined with performance and interview footage culminates in a forty five minute film of the not so glamorous reality of life in a touring band at work and play, as they trawl their way across Europe over eight performances. The DVD includes an interview with ghoul-guide Dani Filth, interspersed and peppered with live footage and backstage shenanigans, culminating in the entire hour long set from this year's highly anticipated Graspop festival appearance.